An incredible weekend raising money for SpecialEffect on the Twin Town Challenge 2018! The Twin Town Challenge 2018, in aid of SpecialEffect, was held over the weekend of 25th – 28th May. 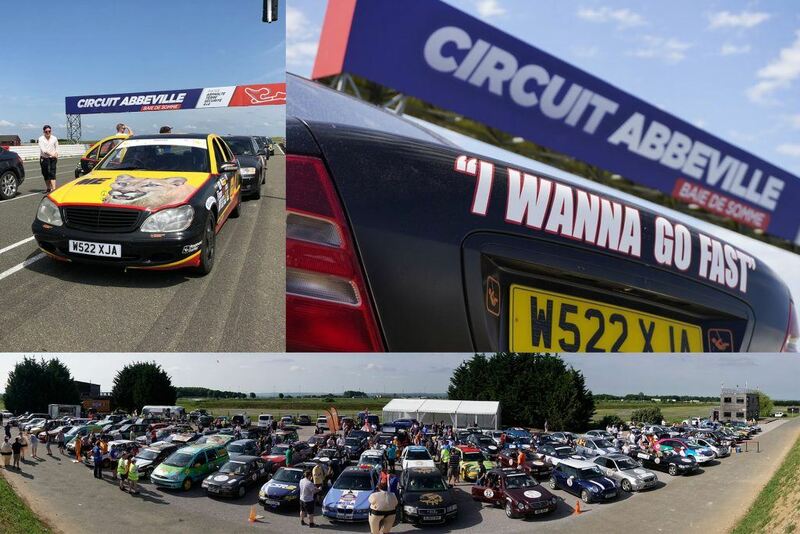 As well as Playground Games being a headline sponsor of the event we re-assembled our team of petrol heads for a weekend of automotive challenges in a sub £500 car. This year there was a theme to follow – ‘The Movies’, and throughout the weekend we would collect Oscars to score as many points as possible. 2016’s Lexus LS400 had set a very high bar for our £500 car choice. Our preference was something big, comfortable, and of course it had to have at least a V8! 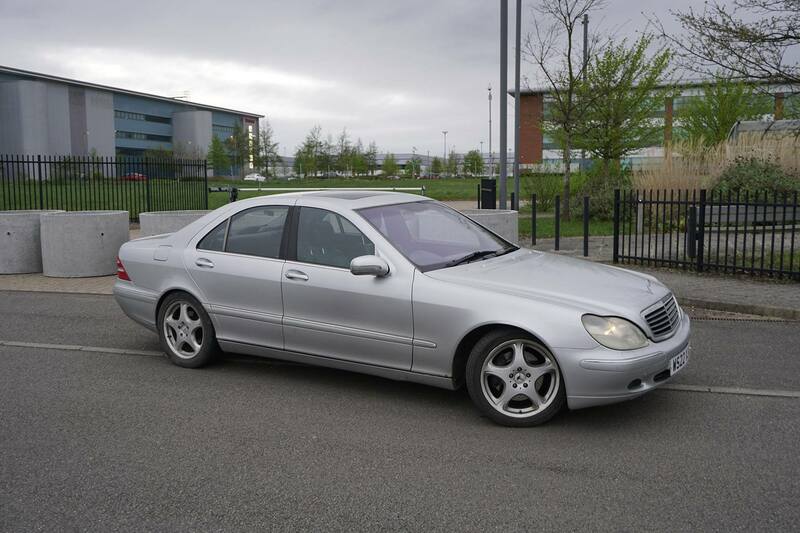 After a long search we finally found our victim – A 2000 Mercedes S430. The 4.3 V8 model with huge leather seats, air suspension and far too many gadgets! It had a few bumps, scrapes and bits of “character”, but it was still a lot of car for £500! 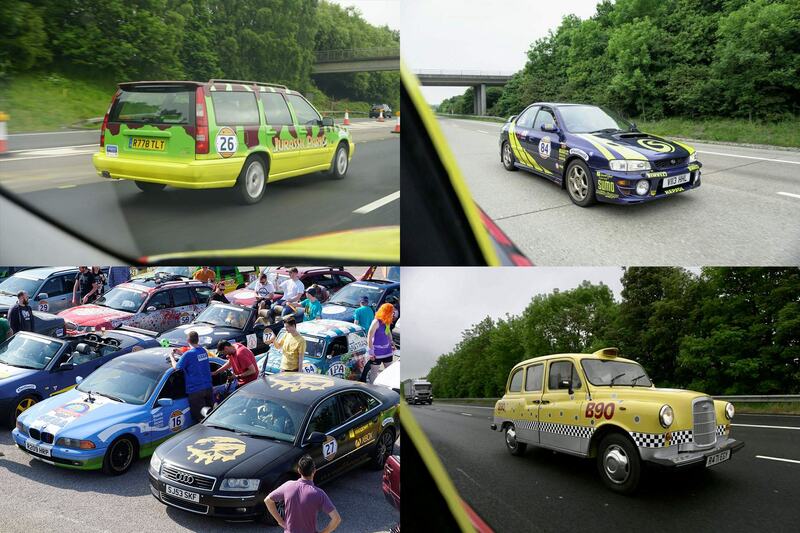 As the event was movie-themed, we were keen to replicate a famous film car. We discussed what our favourite cars were, one idea kept coming up – Ricky Bobby’s self-sponsored car from ‘Talladega Nights’. It looks like a racing car, has a V8 and we were confident we’d be the only team with a cougar on the bonnet! Chris got to work on making the V8 sing more as it should by removing the rear and mid boxes of the exhaust, Dave started making our graphics – all by hand! 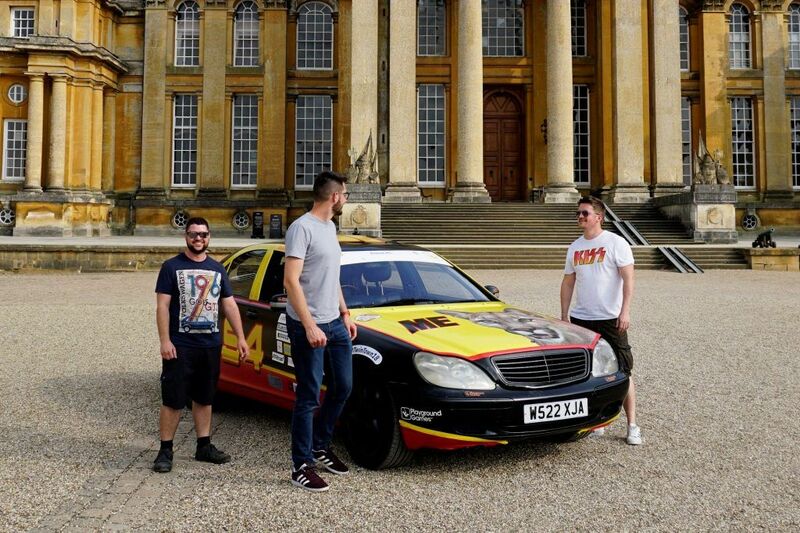 We stood back from the car having finished only the night before and couldn’t help but smile at our handiwork – we were ready to “Shake and Bake” our way to Blenheim Palace! Friday morning was so wet that we were worried most of our livery might have washed off before we even reached the start line at Blenheim Palace! It survived, we revved and weaved our way past Braveheart, Scooby Doo and the gang, The Flintstones, a few Jurassic Park cars and many more, and parked amongst our fellow Twin Towners. A surreal experience! We were waved away from Blenheim Palace and headed straight to the Eurotunnel at Folkstone where thankfully the rain had stopped. The big Merc was already proving to be a great choice, we thoroughly enjoyed “engaging slingshot” and making some noise past other teams – especially our fellow game developers, Sumo Digital, in their Impreza! People were waving from the motorway bridges on the way to Folkstone, Twin Town even got on National TV news! Once in France we turned off the first exit of the motorway and began our first point scoring exercise of the weekend. It was a treasure hunt through the spectacular and beautiful coastline south of Calais. We finished with a short hop on the Autoroute to Le Touquet and gathered with all the other participants for an evening of quizzing, fundraising and awaiting Sumo’s David Blewitt’s arrival from his 52-mile Ultra Marathon! What a hero! Saturday’s activities involved a “car booty” hunt for some local items we had to translate from French such as a bulb of garlic, which we translated as a lightbulb – oops! We had to record a ‘Carpool Karaoke’ of Bohemian Rhapsody by Queen and film a recreation of one of our favourite movie scenes. Unfortunately, we only managed two out of 3 of these after our Mercedes got stuck in first gear and we lost time trying to diagnose the fault. And finding the O-ring Andy dropped into the engine bay… It turned out that a simple “turn it off and on again” was good enough, we replaced the O-ring and were away again. Sunday was the day we were all looking forward to. We were spending the day at Abbeville Circuit, around 45 minutes south of Le Touquet. 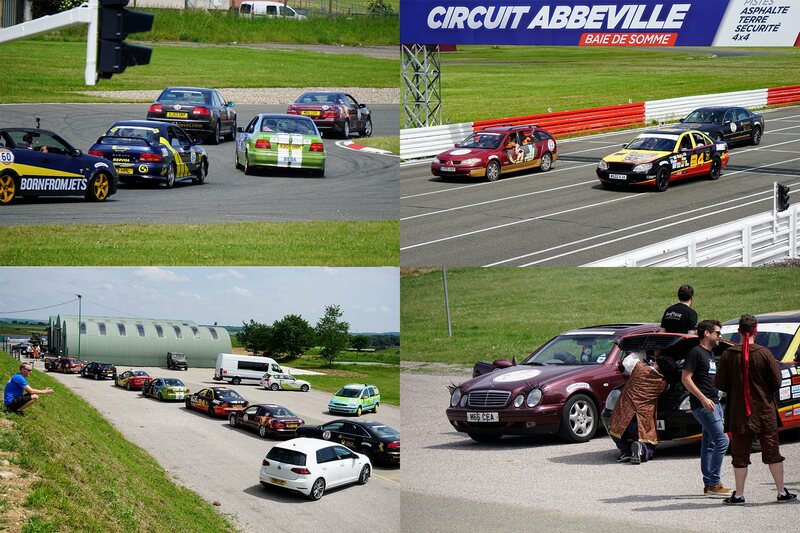 A series of challenges were set out for us on the track utilising a mixture of ingenuity and driving skill! First up was ‘Car Boxing’. A large metre square box with a rope handle was given to every occupant of the car including the driver. We had to complete a slalom course, reversing back down again. Dave managed to climb out of the sunroof and he and Chris supported the boxes in a way I could still use my wing mirrors – we easily navigated the course safely and quickly. Next was ‘Car Fencing’. A game you probably all played as a child had been upscaled to be played from our car window! A long wire spelling “TTC18” had to be negotiated with a hoop on a pole, every time you touched the wire a car horn sounded, and a penalty was added to your time! ‘Car Bowling’ was all about Jackie Stewart style smooth driving. A shallow bowl was placed on the bonnet of the car with a ball placed in it and we had to drive a slalom course as quickly as possible without losing the ball. None of these tasks were ideal for a 5m long executive saloon, but Andy tackled it as quickly as he could. And with no spillages! ‘Car Jousting’ was the last point-scoring challenge of the day. Chris drove the slalom for this course, and Dave had to use a jousting pole to collect hoops from the top of cones, before reversing back down the course replacing the hoops. (How civilised!) Again, a strong effort was put in by ‘Rated PG’. We were pleased by our performance! ‘Blind Driving’ was a non-point scoring event this year, but it made for great entertainment. Instead of a slalom course we were doing a whole lap of the Abbeville kart circuit! Dave drove, Andy directed him with as clear instructions as he could. The result was both hilarious and surprisingly impressive! So much so we questioned Dave if he could in fact see anything as he drove! The finale of the day was the Game Dev Grand Prix! Though we were kept under control by a pace car (boo!) there was still plenty of overtaking action, a breakdown and maybe even a little off-track excursion by one team… It seems the Rare Pirates were most upset about the outcome on track – we caught them trying to steal our 3 pointed “medallion” from the bonnet! After a night of celebrating with all our fellow Twin Towners in the streets of Le Touquet, it was time to head home. With some looking a little worse for wear than others, this year’s Twin Town Challenge finished where it started at Blenheim Palace. 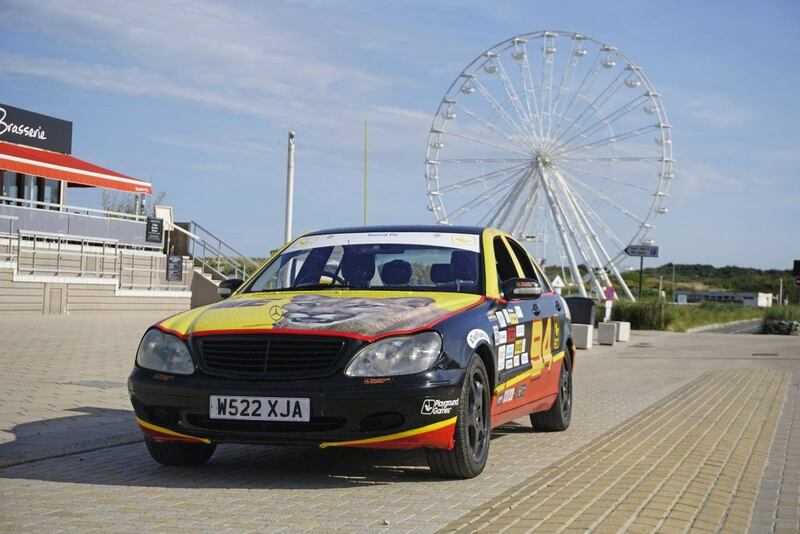 We revved the Mercedes through the finish line to applause and laughter – we had made it! 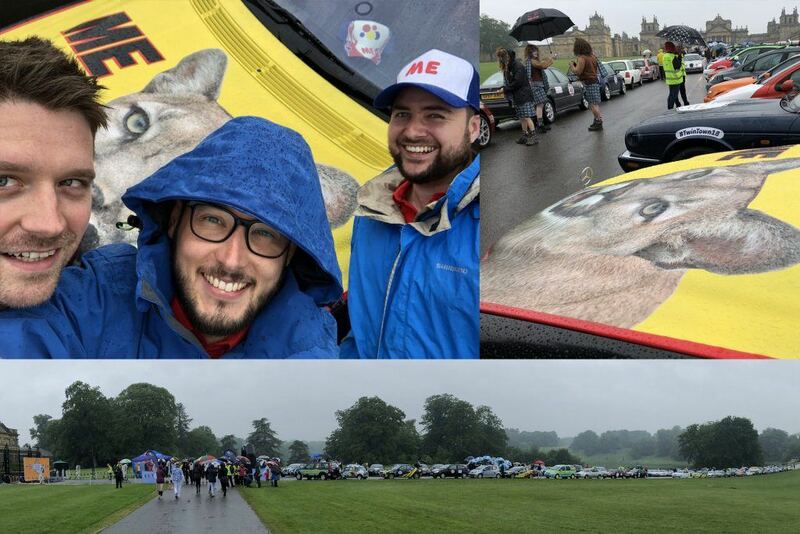 Parking a £500 Nascar replica with a cougar on the bonnet in the grounds of a World Heritage Site is not going to be something we forget any time soon. All the teams gathered together one last time to celebrate the winners and the losers of the weekend, and the great amount of money that the event has already raised for SpecialEffect. It was time to say goodbye to our friends and head home. Our Mercedes is due to be sold on a special sponsored eBay listing along with some of the other cars in the event – maybe you could be interested in buying it? Watch this space! Special Effect is an incredible charity that is close to the hearts of all at Playground Games. They offer people with complex physical disabilities the opportunity to have a better quality of life by enabling them to access the games and technology that we take for granted so often.